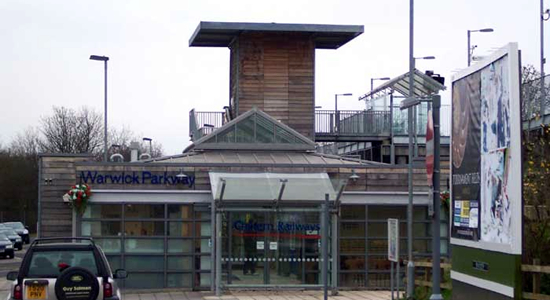 Warwick Parkway is something of an anomaly in the region - a recently constructed and privately funded station. 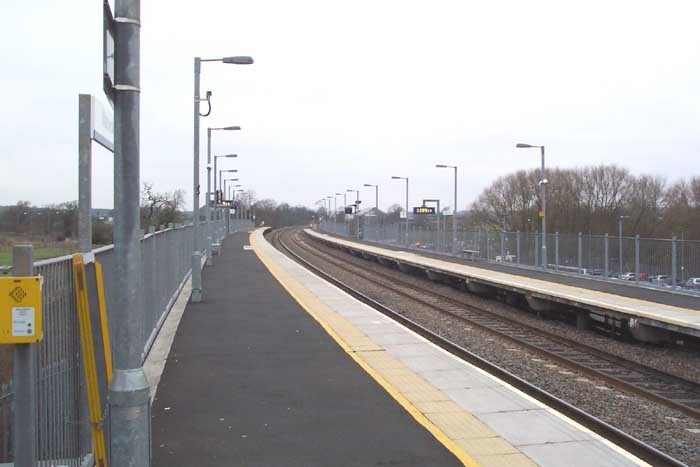 The station was opened in 2000 by Chiltern Railways on the premise that the area is rapidly developing and thus transport demand from commuters increasing. This seems to be borne out as the extensive car park was near full and the station itself is seeing some 350(ish) passengers a day using the site and this figure is increasing. 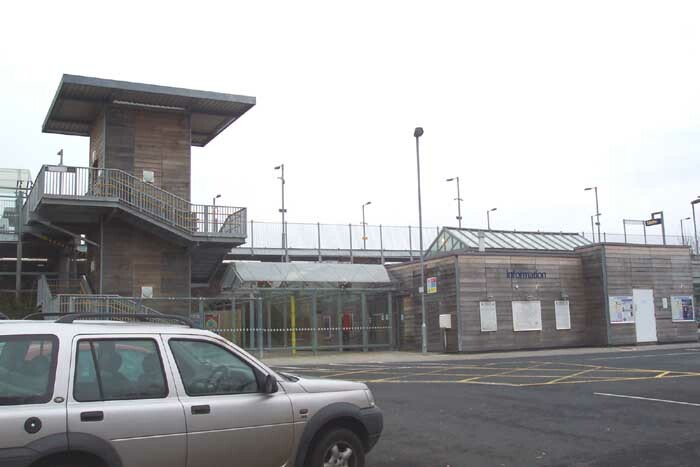 That said, I have rarely seen such an odd looking station (possibly Smethwick Galton Bridge - but that station is odd in a good way) - the architect was obviously amusing himself when choosing both building materials and the overall structure of the station building. Above we see the station building itself from the car park off Budbrooke Road - the strange tower above the building houses the lift shaft to the Leamington Spa platform: subtle? I hardly need to comment on the building material: wooden fascia of a very light hue - looks like a DIY project to be truthful . . . £5.2m indeed! Above-left we see the side of the station building from the car park with the Leamington Spa platform soaring above on an embankment. Above-right we are on the Birmingham platform looking across to the Leamington Spa platforms and can clearly see the top of the aforementioned lift shaft and the ubiquitous bus shelter - Chiltern Railways were certainly erring on the frugal side when they were aportioning part of the £5.2m for platform amenities. 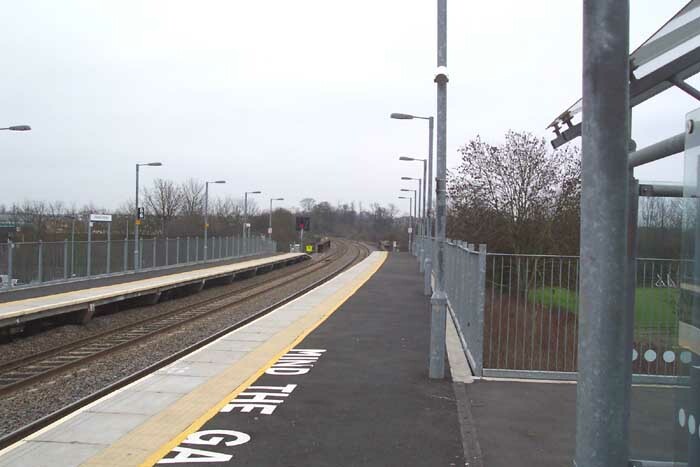 To illustrate this point, above-left we are on the Birmingham platform looking towards Birmingham and above-right looking towards Leamington Spa. 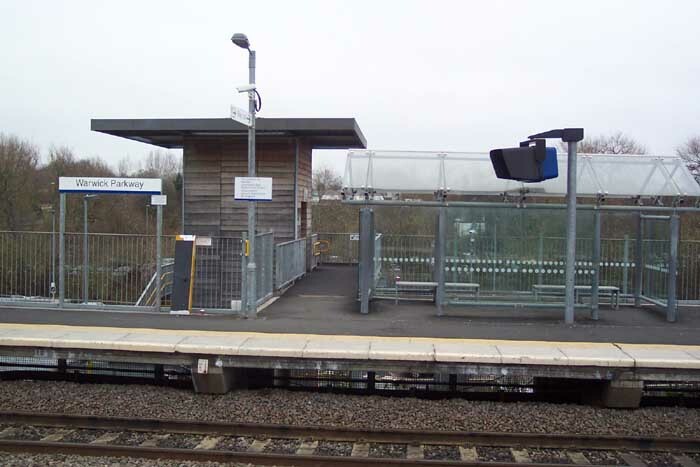 The station is large, the facilities are miniscule: on the day I was there with the area being quite exposed and high on an embankment the station was battered by high winds. Additionally, get a handful of people in the bus shelter on the platform and everyone else is forced to brave the elements. I have to admit to not liking this station at all (you may have already got that impression). Whilst I am 100% behind the full realisation of the rail network and park and ride etc . . . I think a much better job could have been done of this station and a good opportunity has been missed for a showpiece facility.